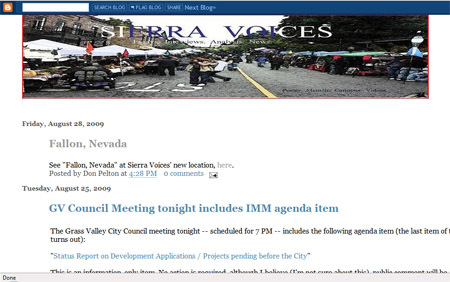 I’m impressed with the facelift for Nevada County resident Don Pelton’s Web site, SierraVoices.com. 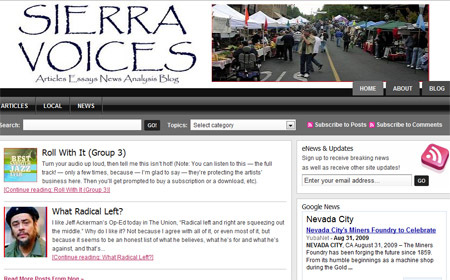 It’s an upgrade from his former site, SierraVoices.blogspot.com. This is sort of like the transformation I went through (a very long one) in which I transferred my sports blog from this site, to addisports.com. During that time, I utilized a blogger account… Yes, I am shamed. It was my being cheap that led me to do it. I took advantage of Blogger’s ability to host your own domain, and seeing how I had purchased addisports.com a long time ago, I thought it would be great to break out the sports from all the other stuff I write about. About this re-engineered site, yep it’s WordPress, and it took me a couple of months to get up to speed (it felt like it took me forever). I finally hired a WordPress consultant to give me a few well-placed tips and nudges, until I could comfortably handle it on my own. Now that I’m happy with how it looks, my creative juices are really flowing. By the way, yes it’s a blog, but it’s also more (”It’s a floor cleaner AND a dessert topping!”). I’m using WordPress as more of a “content management system,” and my vision for my site is that of a magazine or journal, only one part of which is a blog. I’ll keep dumping my thoughts out to the blog, probably almost daily. But I also intend to write longer, more thoughtful articles (for the “article department”) and essays, etc. In fact, I hope to solicit articles from others. We’ll see how that works out. For that purpose, though, I really wanted a professional looking site, and I believe I’ve got that now. Stay tuned. I’m sure this is rather flattering for a guy that doesn’t have a lot of attention pointed at him, per se, but I think it’s a good opportunity to point out how dynamic a tool like WordPress is and how, with the right theme, you can mirror what magazines and newspapers do and literally create your own localized Huffington Post. It’s why I dropped blogger and it’s why I have a stable of themes I’m itching to try every other week. Zuri, thanks for the kind words. We both know — and you said as much — that the credit is due mostly to WordPress. I’m eager and delighted to acknowledge that, because — since I retired from my Stanford job as a systems programmer and network engineer — I no longer take delight in tinkering “under the hood.” I just want to get “behind the wheel” (to torture the metaphor a bit more) and just drive somewhere interesting. With Blogger, I couldn’t get under the hood if I wanted to, and it was like driving a Yugo. The possibilities for excellence are much greater with WordPress, and the support community is fantastic. At this point, I’m just free to concentrate on content.